Every web resource is a figure as an active audience – users, regularly return to the site and spend there at least one hour per week. These people are the cornerstone, through which is formed as a traffic site, and submitted to the popularity of its brand pages. However, there is another active audience, rozrahovana than for a specific site, and for the entire Internet. Similar is the users, conducting online at least one hour per week. As an active Internet audience to convert to an active audience of your site? Several years ago the answer was unequivocal – search engine promotion. Really, in the search for information by any user sooner or later come to Google or Yandex and enters the search string you want to phrase it. But search engine promotion applies only to that part of the audience, something that looks. And what about other potential customers? Відповідно до досліджень за 2011 year, not less then 75% Internet users registered in social networks. This is where users are most active, for example, Average user network "facebook" spend it more 7 hours per month. Will be more large auditoria, which is difficult to attract traditional methods. When traditional methods of promoting longer working, in sprava vstupaє SMO! Optimization for Social Networking (Social Media Optimization) – This site changes so, to motivate users of social networks link to the site and quote his materials. Among CASTCOM are unique methodology of quoting site in social networks and blogosphere. We work in this market from the beginning and Skills SMO at the highest level. The company specializes in website promotion in social networks Facebook, ВКонтакте, Classmates. The first results you can see in a month. variability and flexibility of the campaign. acceptable to the customer for. Have Advertising in social media and you will learn about the millions of! Social Networking (VKontakte, Facebook та інші) quickly become a common service for millions of people around the world. High attendance and active social network users to effectively use these services for marketing campaigns, opening for brands incredible opportunities. Advertising companies in social networks (SMM, WE) – This relatively new, but well-proven ability to attract potential customers. What are your social media business? Distribution of the brand and attract new customers. At a speed of social networks. By offering your page in your Facebook 100 friends, you know, that they will review its. And if the page is interesting and deserves attention, that friends offer this page to your friends, friends of friends, etc.. Contact with customers and socialization brand. Your page in the social media becomes a place for dialogue with customers, here can ask questions and comment. Developed page company deployed response to user feedback provides them with positive emotions and creates a more relaxed attitude. Extra traffic got into this site. 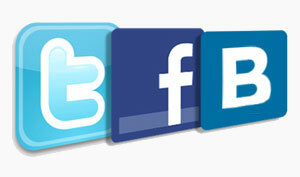 On your website visitors begin to come from social networks – Facebook, ВКонтакте, Classmates, Twitter. Increase Sales. Extensive information about the company in social media is credibility and stimulate increased sales. Створення та підтримка соціальних акаунтів компаній. Ми готові створити групи в популярних соціальних мережах, знайти вашу цільову аудиторію, запросити її в групу і ненав’язливо рекламувати Ваші товари чи послуги. Advertising in social networks. Розміщення контекстної реклами в соціальних мережах приверне велику кількість цільових відвідувачів на Ваш сайт. Чіткий таргетинг, низька вартість, лояльне ставлення користувачів – рекламу побачать ті, кому вона цікава. Соціальний медіа маркетинг (SMM). Ми використовуємо інструменти соціальних медіа, такі як блоги, мікроблоги, чати, форуми, ЖЖ, підкасти і інше для просування сайтів компанії. Не ігноруйте соціальні медіа – це потужний інструмент просування вашої компанії, який працює не гірше, ніж розкручений сайт. Бронюйте promotion in social networks.